What else can I say about Leh that has not been said already? This was my biggest concern when I thought of writing about Leh. I like to post at least something about all the important places I visit, so I had to do one for Leh. However, a pathological fear of cliches prevented me from visiting the Shanti Stupa or for that matter clicking a selfie at Khardung La (although I had to cross it anyway). Another cliche, the Leh Palace, though looked irresistible from a distance, at the top of the hill, lording over the whole city. A bit of research assured me that a bit of meandering around the narrow alleys of the old city can be a cure for my phobia. As I explored a bit more, I gradually got convinced that a heritage walk around the town should solve my problem. 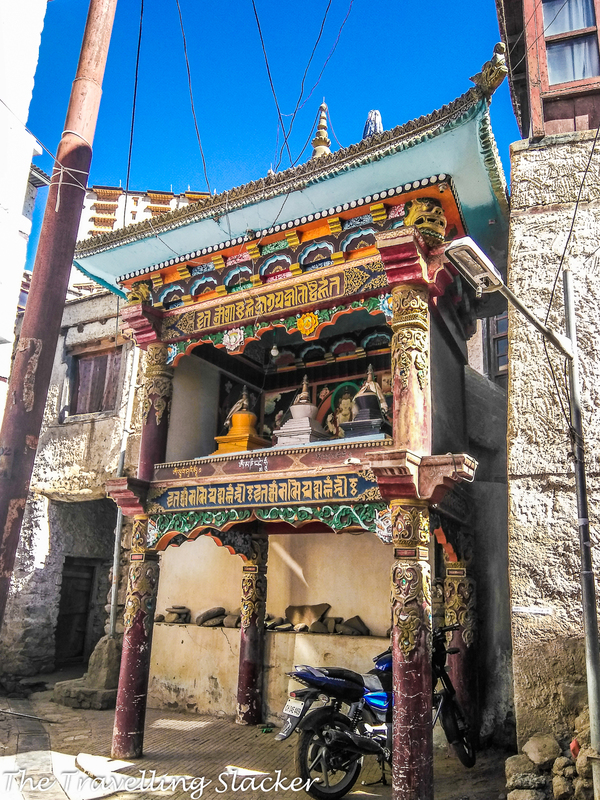 So, this is an account of a prolonged walk along the old town of Leh. 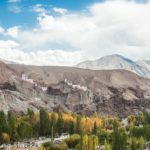 How can I go for a heritage walk in Leh? Are there any entree fees for the monuments? The organization responsible for the restoration of this building and the rest of the old town is the Tibet Heritage Fund (THF). It came up with the award winning Leh Old Town Initiative (LOTI) in the last decade to save the crumbling old buildings and and save the heritage. The cafe was being run by some local women. I enquired them about the artifact outside the house but could not get any clear information. So, this cafe is an attraction on its own. It was apart of old Sankar gompa which was on the verge of extinction. It was adopted by THF/LOTI and was turned into a cafe and gallery of local arts. The cafe offered usual beverages, sandwiches, eggs, along with local products like seabucktborn and apricots and also selling small artifacts. The clientele seemed mostly western while desi tourists were completely absent, except myself. The good thing here is that you can climb up further and sit on the roof, which offers a direct view of the Leh Palace and Tsemo Gompa. I ordered a glass of seabuckthorn juice and a bowl consisting of of roasted barley, apricot kernels, and raisins. More importantly, I realised that the heritage walks are organised from here. I enquired about then walks but the problem was that in the end of September, the tourist flow was already waning and no guide was present either. The lady at the cafe said that she can call a guide if I can gather more people. I thought it was a good idea and considering my social skills and salesmanship, decided to embark on a self-conducted solo meander through the Leh Old Town. But before moving forward, I also need to get back to the intriguing stela that I mentioned earlier. I could not extract much information from the people at the cafe but they convinced me that it is indeed an archaeological gem and not a new replica. Surprisingly enough, I found out more about it after a few days, in a most unexpected place. I have already mentioned the Achinathang Travellers Home in my Brokpa Area post. That is run by a family of local historians and so they also had some books and documens out there. So, whilst doing pages through a workout book, I just noticed a photograph of the steps at Lala’s Cafe! Apparently, it was dug out at a nearby house belonging to Tak Family, and was later on adopted by the THF. The figure carved on the monolith represents Avalokiteshvara and dates back to 8th century. I left the cafe and started walking around the old town. The absence of a guide made it somewhat difficult because I could not always figure out which way to go, but I never stopped walking. As a matter of fact, this whole old town was a walled city in the middle ages, just like Old Delhi. It started losing its prominence after the Dogra invasion in the mid-19th century. The royal fmaily moved to the palace in Stok, ar oudn 12 Kms away from Leh, after that and the walls and houses also started crumbling. Also, with the advent of modern era, the ancient caravan trade, that made Leh a prosperous trading hub connecting Tibet to Kashmir and Central Asia, also died down. However, one can still find interesting remainders of that era if you look around and the aforemetnioned restoration intitiave has done a good work of labelling many of the old buildings. For example, I saw a house called Hor Yarkandi House. As the name suggests, the owners of this house must have come from Yarkand (currently located in the Uyghur dominated Xinjiang Province of China), which was a major point during the heydays of the Silk Road. So, I think this is a remnant of that era and that route, just like those Bactrian Camels in Nubra Valley. Do you spot the snow in the background? I spent a couple of hours walking around the town but I regret having gone ahead without a guide. Some guidance and local interactions could have given me more material but still I had seen much more than I was expecting. It also gave me an opportunity to click the Leh Palace from different angles. Back at Lala’s Cafe, I had also seen a map of the town with a list of all the major points in Leh Old Town. I could not see all of them but I am reproducing the list if anyone is interested. House in the Old Town converted into a homestay. Finally, I started hiking towards the iconic Leh Palace. As mentioned already, the royal family moved to Stok after the Dogra invasion. Now, it is a protected monument and you need tickets to go in. It is sort of an engineering marvel. It must have been hard to build so many floors at that height, in a region like this. Nevertheless, interiors of the palace now are mostly empty. I think the best thing about the palace is the views. It looks great from a distance, and also the city looks great from the top of the place. There are multiple important temples that are also considered a part of the palace complex, namely Chamba Lhakhang, Guru Lhakhang, Soma Gompa, and Chenrezi Lhakhang. The Namgyal Tsemo Monastery is probably the most photogenic monument in Leh, located even higher up than the Leh Palace. Founded in 1430 by King Tashi Namgyal, it has a three-story high gold statue of Maitreya Buddha inside, along with ancient manuscripts and frescoes. However, I felt that it looks better from a distance, just like the palace itself.In fact, it can be seen from practically all parts of the city and it ends up in your photographs even if you don’t want it to. Finally, at the end of the palace visit, I came down and after some struggles, located the newly built Central Asian Museum (behind the State Bank). This is also a part of LOTI and has been opened recently. As the name suggests, it is another tribute to Silk Road era and a celebration of Leh’s status as a trading hub of the medieval world. Sadly photography is not allowed inside so I can’t reproduce much of what I saw. It is a multistoried building with a brillian design reflecting local craftsmanship. It is located in a densely populated corner of the town and so it is hard to get a clean shot of the building. I got one from the first floor of a restaurant nearby, this only shows the upper part of the building. Every floor of the museum is dedicated to one particular culture, such as Lakadhi, Balti, Kashmiri etc. The area around the museum is also interesting with an old mosque and also a tree revered by the Sikhs called Datun Sahib. You will also find a baker’s place making fresh traditional breads in a giant furnace just outside the museum. While coming out of the museum, I also noticed a mask-dance ceremeony going on inside the gompa beahind the main bazaar. Since it does not happen every day, I gladly accepted that stroke of luck and clicked some pictures. I was done with Old Leh, but there was something remaining called Zorawar Fort. It is located on the Fort Road named after it. Zorawar Singh was a 19th century Dogra general who conquered Ladakh, Baltistan, and parts of Tibet. It was a rare conquest of an subcontinental power into the Chinese territory. Although, he overplayed his hand and eventually lost his life in the harsh and hostile terrains of Western Tibet. Anyway, the fort built by him still remains. It was restored by the army in 2006. The landscape is expansive in this area as it is located on the other end of the city, away from the congested old town as well as the market. If you leave the road and take the inner alleys, you will find more interesting views like this golden apple tree with sinful red fruits I found. So, the walk was over although there are a few more things remained, such as the Sankar Village and Gompa, and the Moravian Church. But what made me glad was that the conserveation efforts were sincere in nature. There seems to be a lot of international funding to help these projects and unlike some other heritage sites in India, Old Leh is getting the support it deserves. You can do it yourself with a bit of research. But if you need a guided toor, go to the Lala’s Cafe mentioned in the post. That is where you can get the guides. They generally do it twice in a day, once in the moring and once in the afternoon. The formal walk lasts a couple of hours. I was quoted INR 400 for the formal walk with the guide although eventually I did it myself at no cost. The Leh Palace (INR 25) as well as the Central Asian Museum (INR 50) has entry fees. The rates are much higher for foreigners (dunno why!). I appreciate your time and effort in your work. Keep posting..
Ladakh is that place that retained the charm of yesteryears. I hope to visit Leh and check out the same spots you have visited. I am totally up for a walk around Leh. The buildings look very rusty but I can see myself getting lost in the streets and just wandering around for a while. Want to see that fort as well, see what a fort looks like in this part of the world (I love exploring forts and castles all over). Love the photos. I understand your concern about posting another cliche view of a place that you visit. But each of us do see things through a slightly different lens. We too like to just wander through the old towns of places we visit. But wandering without a local guide does mean you miss some of the stories about places. Thanks for the list of places to see when you head out on your own. I am glad you also provided some views of the more popular sites in Leh. Since I have not looked at this as a travel destination yet! Stumbling upon things is the best. I don’t think I would have known to climb up the ladder to get to the café! I love the splashes of bright colors against the stone. I love such heritage walks. So much to see and experience. You have compiled a good list of places. I would prefer a guided tour around the place. That is a gem of an experience that you have shared. I missed the Central Asian museum this time over a trip to the Aryan village. The Leh Palace – I have always loved it for its quaint and unique style. I need to get back to make the smaller discoveries that you have shared. Now that’s one long list of things to see in the Old Town of Leh! The palace certainly dominates the scene and it’s a good tip to have a guide to show you around so that someone can explain the places to you as you go. Lala’s cafe and art gallery look pretty cool! I love the snow-capped peaks in the backdrop. Oh wow, this museum is way up there! I would love to be able to visit the palace complex.